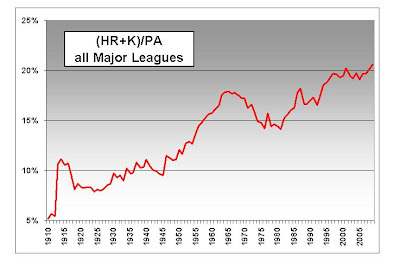 Major League Baseball set a rather dubious record in 2009. For the second consecutive year and the third time ever, the percentage of plate appearances resulting in a home run or strikeout topped 20%, continuing a pattern that started in the 1920's and shows no sign of slowing down. So what? Well these are the two outcomes - the only two - which involve no defense or base running; the things that purists claim make the game unique. That makes for long, boring games. You have to worry for the long term success of the game if it devolves into the game of "strikeout" we used to play as kids, while the fielders just stand there and watch. 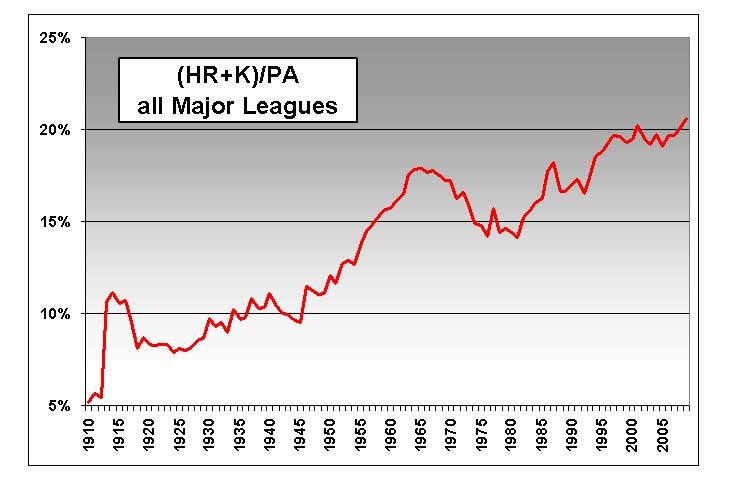 Bill James writes about this in greater detail on his website and offers some ideas for correcting it. The site is well worth the $3/month subscription fee.